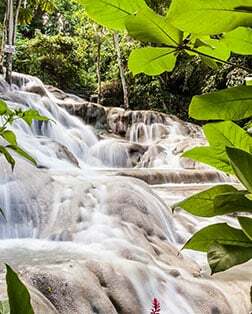 Jamaica's world famous waterfall cascades 600 feet down a giant rock staircase to the Caribbean Sea. Climb to the top or use the adjacent walkways if you prefer not to get wet. Explore the lush tropical jungles, waterfalls and sparkling pools of this beautifully landscaped garden and adjacent historical museum built on grounds dating back to British colonial times. Venture away from commercial areas for a tour of one of Jamaica's historic Great Houses or plantation estates, where bananas, sugarcane, coffee and allspice are still cultivated today. The exciting attraction which opened in 2008 serves up incredible views, and features the Sky Explorer Chairlift, Jamaican Bobsled ride, interesting displays, infinity pool and value priced restaurant. Fun for the whole family! This is an attraction not to be missed. Enjoy a journey along Jamaica's scenic coastline to the historic Martha Brae River where your 30-foot, two-seater bamboo raft is waiting. Don't miss an unforgettable opportunity to interact with bottlenose dolphins at Dolphin Cove, a magnificent ocean themed property. Interact with these playful mammals, learn training secrets and enjoy a host of water related activities. Shimmering turquoise waters, soft white sands and postcard perfect views make the tranquil beaches of Ocho Rios some of the most sought-after sites on the island. Zipping through the forest on a canopy tour, river tubing and traveling on a bobsled ride are some of Jamaica's favorite soft adventures.